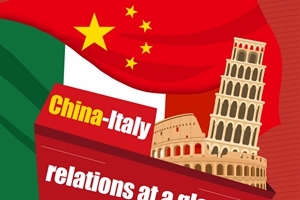 President Xi Jinping starts a state visit to Italy Thursday. Let's take a look at the ties between the two countries. President Xi Jinping will pay state visits to Italy, Monaco and France on March 21-26. 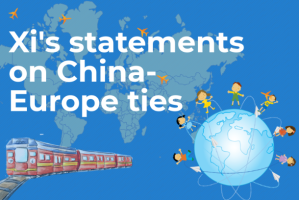 Xi attaches importance to ties between China-Europe. 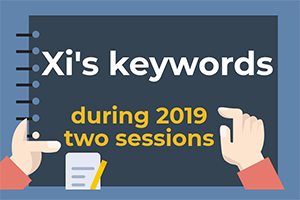 President Xi Jinping joined six panel discussions with national legislators and political advisers during this year's two sessions. Let's have a look at the major issues he raised. 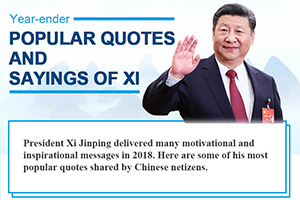 President Xi Jinping delivered many motivational and inspirational messages in 2018. Here are some of his most popular quotes shared by Chinese netizens. 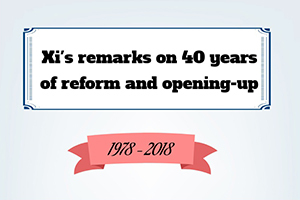 President Xi Jinping delivered a speech at a grand gathering to mark the 40th anniversary of China's reform and opening-up on Dec. 18. Here are some of the motivating remarks in his speech. 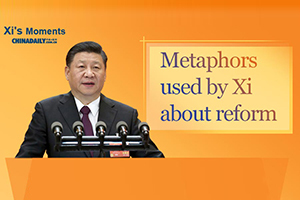 President Xi Jinping often uses metaphors when he talks about China's reform and opening-up. Here we take a look at some of them, which sometimes show Xi's philosophy on national governance. This year marks the fifth year since the inauguration of China (Shanghai) Pilot Free Trade Zone. 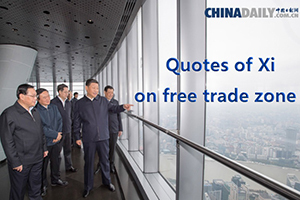 President Xi Jinping has on many occasions given instructions on the development of free trade zones, which play a pioneering role in China's opening up. The fifth World Internet Conference is held from Nov. 7 to 9 in Wuzhen, Zhejiang province. 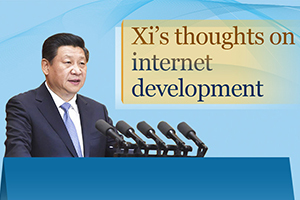 President Xi Jinping has on many occasions called for better development of internet. Let's take a look at his main thoughts. President Xi Jinping will address the opening ceremony of the China International Import Expo on Monday. It's a reminder of how China has never ceased in its efforts to open up, which started 40 years ago. 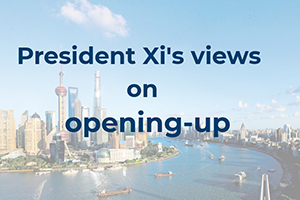 Here is what Xi views opening-up. Oct. 16 marks World Food Day. 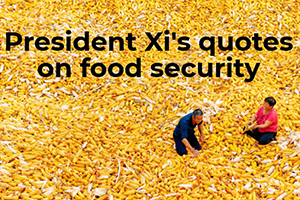 President Xi Jinping has on many occasions emphasized the importance of food security. On many occasions, President Xi Jinping has stressed the importance of promoting the comprehensive development and common prosperity of people with disabilities. Aug. 8 marks the 10th anniversary of the 2008 Beijing Olympic Games. Today we look at what President Xi Jinping has said about sports to see the spirit of sports in his eyes. President Xi Jinping called for BRICS countries to usher in the second "golden decade" of cooperation at the ninth BRICS summit in Xiamen last year. What did Xi mean by "golden decade" of cooperation? Chinese President Xi Jinping started his five-nation trip on Thursday. 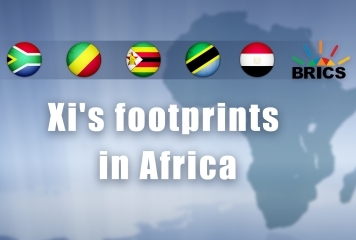 Before this time, Xi has paid three previous visits to Africa. 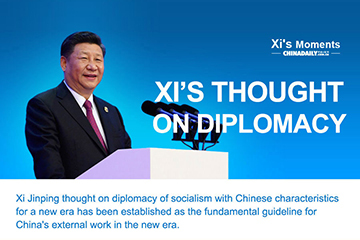 Xi Jinping thought on diplomacy of socialism with Chinese characteristics for a new era has been established as the fundamental guideline for China's external work in the new era. 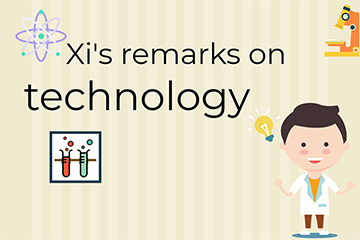 The infographic below shows some key remarks from Chinese President Xi Jinping on technology. Youths are among the group of people who have received the most letters of reply from President Xi Jinping since 2012. 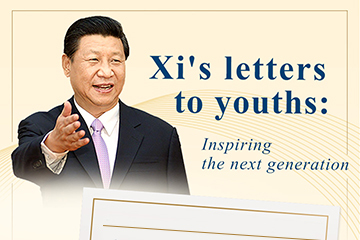 On China's Youth Day today, let's have a look at what Xi said in these inspiring letters. 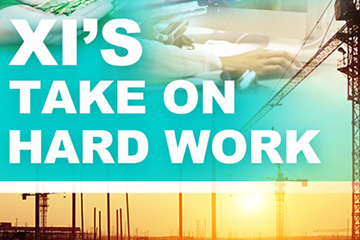 President Xi Jinping's remarks on hard work are inspiring millions of workers to strive for the nation's Two Centenary Goals. On this year's International Labor Day, let's get motivated by his words. China SCIO selects some key remarks from Xi on the work of cybersecurity and informatization in the past two years, piecing together his strategic thinking on building China's cyber strength. 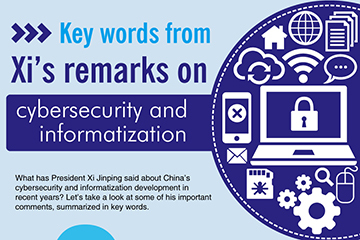 What has President Xi Jinping said about China's cybersecurity and information development in recent years? Let's take a look at some of his important comments, summarized in key words. 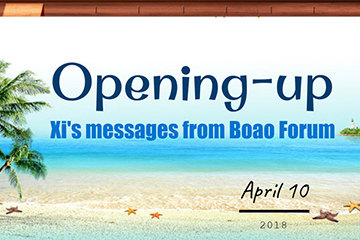 Chinese President Xi Jinping on April 10 delivered a keynote speech at the opening ceremony of the Boao Forum for Asia 2018, winning praise from the international community. 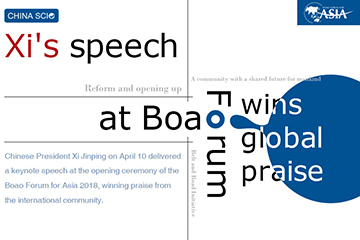 President Xi Jinping delivered a keynote speech at the opening ceremony of the Boao Forum for Asia Annual Conference 2018 on Tuesday. Here is a look at the key messages conveyed in the speech — opening-up. 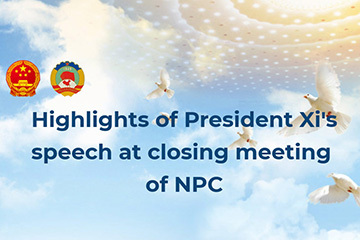 Newly-elected President Xi Jinping addressed the closing ceremony of the first session of the 13th National People's Congress on Tuesday. The following are some highlights from Xi's speech. 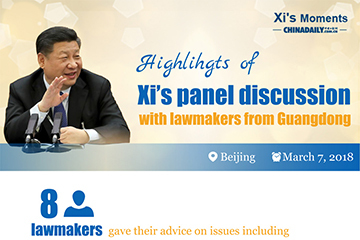 Following are highlights of Chinese President Xi Jinping's panel discussion with lawmakers from Guangdong. Since being established in 1954, the People's Congress System has been China's fundamental political system. 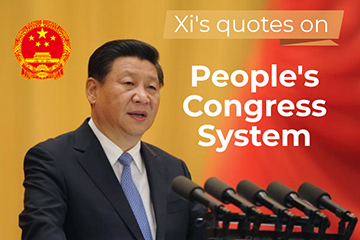 Let's have a look at what President Xi Jinping has said about the importance of the system. 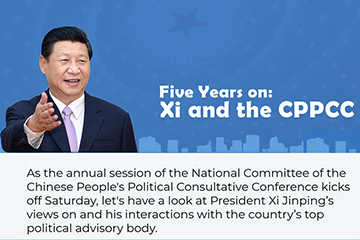 As the annual session of the National Committee of the Chinese People's Political Consultative Conference kicks off Saturday, let's have a look at President Xi's views on and interactions with the country's top political advisory body. Spring Festival, an occasion for family reunions, is the most important traditional festival for Chinese people. 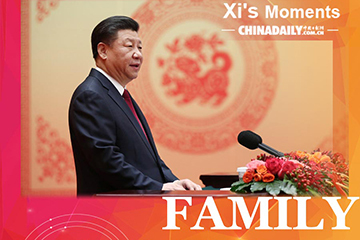 Here, we share President Xi Jinping's view on the importance of family. 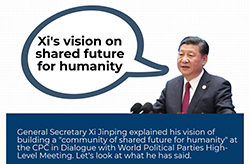 General Secretary Xi Jinping explained his vision of building a "community of shared future for humanity" at the CPC in Dialogue with World Political Parties High-Level Meeting. Let's look at what he has said. 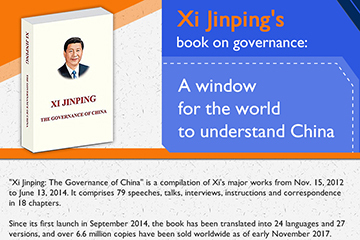 China SCIO has compiled an infographic below to illustrate the publication and distribution of Chinese President Xi Jinping's book "Xi Jinping: The Governance of China" over the past three years.